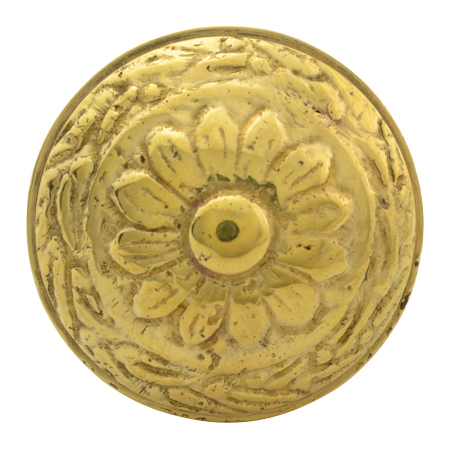 1 1/4 Inch Ornate Round Solid Brass Knob (Polished Brass Finish). This knob measure 1 1/4 inches in diameter with a projection of 1 7/20 inches. Available in polished brass (shown), antique brass, oil rubbed bronze, and polished chrome finishes. This product comes as an un-lacquered natural brass and it will patina over time. A high strength lacquer coating is available upon request. Comes complete with the mounting hardware.